In Stock! Ask for a sample!!! Sea buckthorn is tested by nutritionists sea buckthorn contains rich protein, fat, carbohydrate, vitamins, mineral substances, among which, the content of VC, VE and VA is nearly the most among all fruits and vegetables, especially the content of VC, the content of VC is 3-4 times of kiwifruit, 10-15 times of orange, 20 times of hawthorn, 200 times of grape. In addition, there also contains some vitamin B1, B2, B6, B12, K, D, folic acid, niacinamide, and 24 trace elements etc (phosphor, Ferrum, magnesium, manganese, kalium, calcium silicate, copper etc). 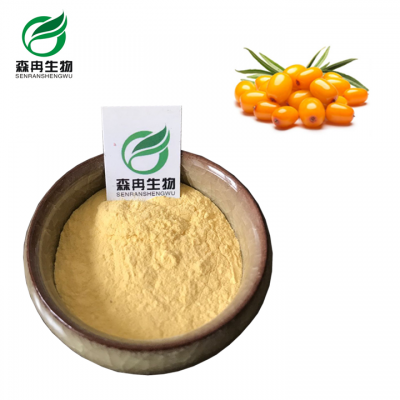 Note: Sea buckthorn Powder can be used for drinks, health care products, baby food, puffed food, baking food, ice cream, and oatmeal. also useful in candy fillings, desserts, breakfast cereals, yogurt flavoring and in any application where a fresh fruit flavor is desired. With enhanced immune function, can improve the cardiovascular system and anti-tumor.